Since she was a little girl, she felt curious about photography and about family albums. With a degree in Law (University of Buenos Aires), she dedicated herself to this professional activity working independently for a short period until she started studying photography at the Photographic Argentine Center. Afterwards she specialized in Black and White techniques and digital photography and she also learnt photographic composition at Buenos Aires Photo Club. In order to develop her artistic skills, she decided to study Drawing and Painting at the National School of Fine Arts. At the beginning she focused on social matters. Some time later, she worked for the media, such as Channel 7 (Canal 7 – public TV station) and was in charge of the artistic and institutional image of the channel. She also made productions for a radio station called Mega 98.3 with very important local rock artists such as Charly García, León Gieco, Vicentico, amongst others. With the intention to link her passion for photography and her joy for fashion, she studied Fashion production and also fashion consultancy (Espacio Buenos Aires). In a short term, she mounted her own Studio in the heart of Puerto Madero. Today, her work team is made up of assistants, designers, producers and stylists. Bearing in mind the idea of continuing with the consolidation of the company she had dreamt of, she made a postgraduate course on Organizational Coaching at Del Salvador University. At the beginning of October the studio moved to a neighborhood in Buenos Aires named Palermo Soho, where design and fashion are greatly combined. Located in 1680 Thames Street, the new Studio is equipped with state of the art technology and has a specially designed roof with natural lightning for photography productions. During 2009, Maby participated on multiple exhibitions and presented its new technique of “photographic intervention”. 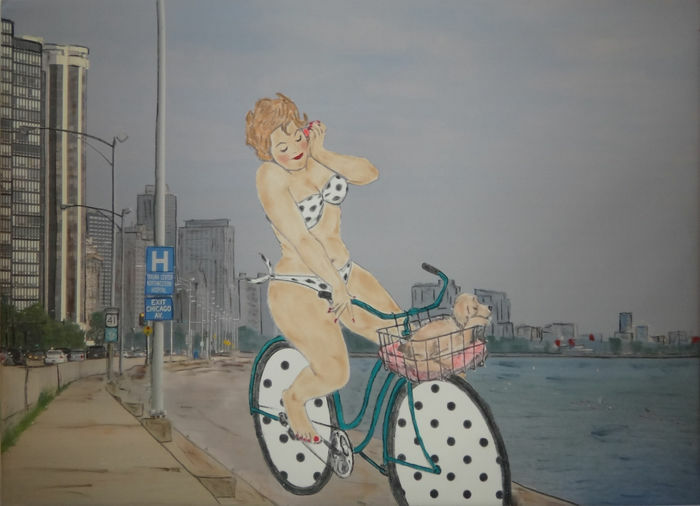 This techniques consist on photographs of different cities of the world and then drawing woman silohuettes with makeup product and acrylic paint. In 2011 Maby introduced a new line of art objects withing a project of applied art, MR uses his images of paintings on everyday objects. In May 2012 Maby Rod inaugurated “Patio Thames” an art bazaar in the neighborhood of Palermo Soho. There you can find several objetcts with artistic imprint.